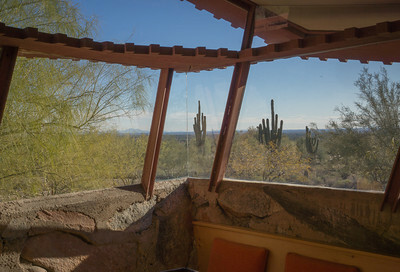 These shots came from a recent bus tour of buildings in the Phoenix area that he designed. I've visited many other Wright buildings, but the old slides aren't usable now. 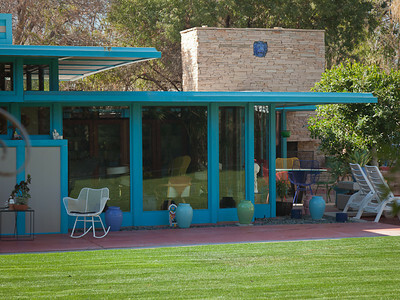 Raymond Carlson House, privately owned and occupied. We also toured the interior; rooms are very small and stairways are extremely steep and narrow. 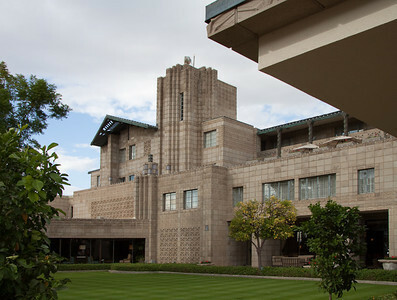 Arizona Biltmore hotel. 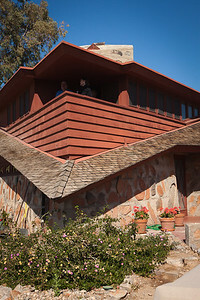 Wright was a consultant and his influence is obvious, but Albert Chase McArthur is architect of record and some aspects of the design are not what Wright would have wanted. 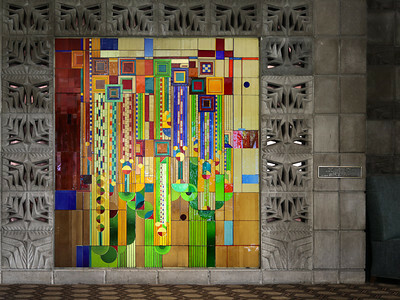 Stained glass "Saguaros" in Arizona Biltmore lobby. 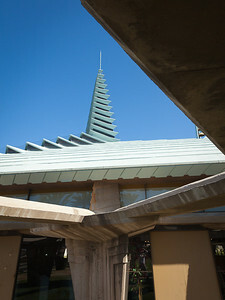 Designed by Wright as a Liberty Magazine cover and fabricated by Taliesin students during a remodeling of the hotel after his death. Chase Bank (after many ownership changes), designed by Wright's student (and our tour leader) Frank Henry. 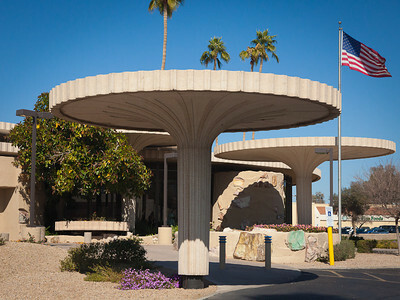 The influence of Wright's Johnson Wax administration building is obvious, but the unique feature of this building is that the roof is actually suspended from the column-top pads. 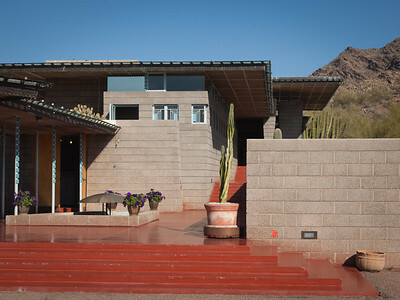 David Wright house, designed for FLlW's youngest son. The house is privately owned but unoccupied, currently for sale. As it's surrounded by a chain link fence, we were unable to tour the interior. Jorgine Boomer cottage. Privately owned and occupied but we were able to tour the interior. There's a spectacular view from the master bedroom (upper right of this shot), but the bathroom has a ceiling that's only six feet high! Jorgine Boomer cottage. 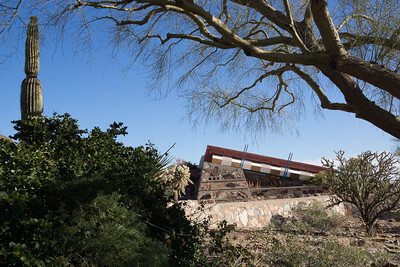 The wall construction of stone and concrete is the same technique used at Taliesin West (image #12). 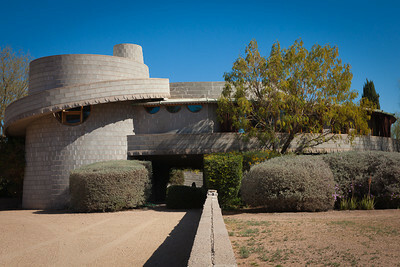 Wright's Adelman house is next-door but barely visible from the street; we were not able to visit it. 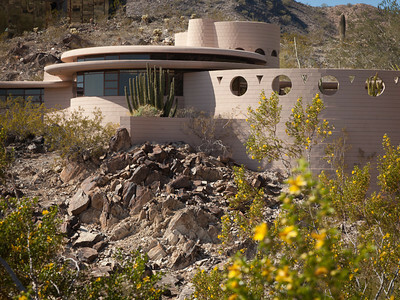 Norman Lykes house, his last residential design (on the drawing board the day he died). Privately owned; we could not tour the interior. 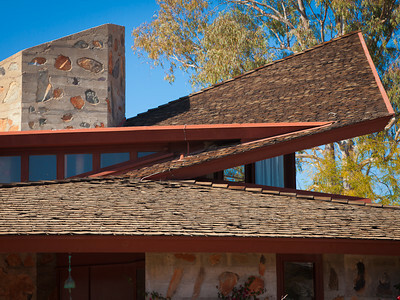 Harold Price house; we were able to tour the interior. Now owned by a foundation that uses it for social events. 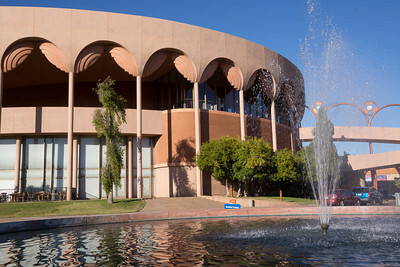 Grady Gammage Auditorium on the campus of Arizona State University. 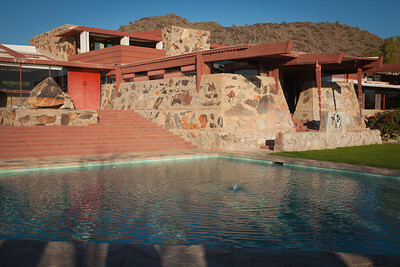 Completed after Wright's death. 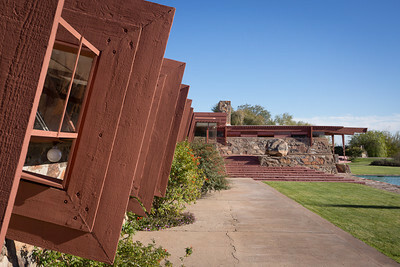 Taliesin West, Wright's own home and studio. 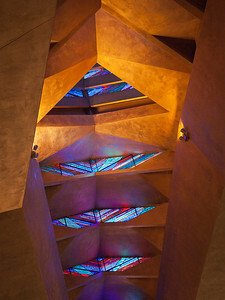 Our tour ended with a walk through this site; I had visited it before, but there's something new to see each time. 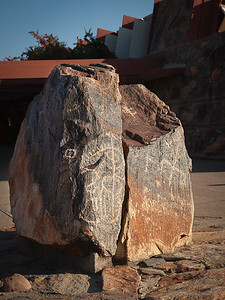 Petroglyph rocks at Taliesin West, found on-site during construction and placed decoratively by Wright. Robert Hansen, an expert in these images as well as photography, identifies them as "Anasazi perhaps as early as Basket-maker 2 350-750 AD." 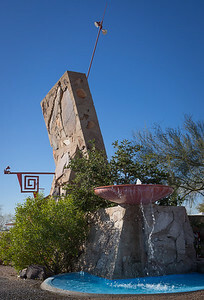 Entrance to Taliesin West -- this and the following images from a later visit. West wall of the drafting room, from entrance walkway. Drafting room beams; residence beyond.